I have had a very eventful year as a beekeeper in 2013. Multiple swarm calls. About half of them have not been bees. Thank God for emailing digital photos. Colony removal. I chalk this up to the weather doing a number on the old trees with colonies. 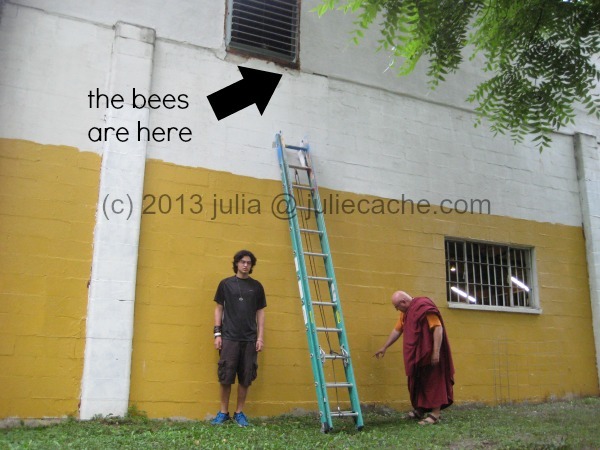 Beginning beekeepers. They keep calling me. Selling at Sweetly Said Gifts. A truly charming store. I don’t know if TIME magazine is responsible for this local honey and beekeeper pursuit, but whatever the origin of the phone calls and emails, I feel encouraged. Here is one colony removal call that looked promising. To understand the scale, my son is 6′ tall. The buddhist next to him is maybe 5′ tall. There was definitely brood that died in situ. Between the time I got the call (early morning) and the time I arrived (dusk), the tree company spread this poison and the bees moved to a nearby lilac bush. 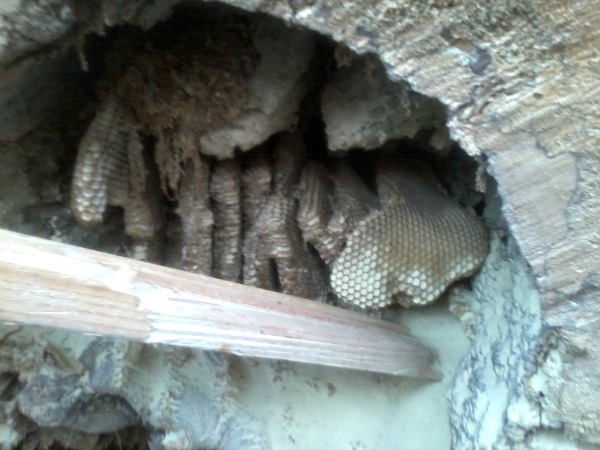 I struggle about what to do with the bees that left this hive. I removed the comb that you see in the photo because a few of them kept visiting it and got coated with the poisonous powder. Are they poisoning their sisters? Will they live another month? Is my equipment now contaminated? How many resources do I invest in this colony? They are currently quarantined near the tree from which they came. I also started a Facebook group for local keepers. It is accessible to people who maybe don’t use email or aren’t fans of yahoogroups. About half are keepers currently; the other half are prospective keepers. The most promising bee development this year is selling at Sweetly Said Gifts. See the brown box of lip balm near the register? No? It’s probably because of this cutey-pie. Family businesses are good like that. You can buy Iowa made gifts here, like candles, aprons, and HONEY and LIP BALM. For hours and location, visit the store’s website. I saw a few things I liked, and feel good about supporting Iowans. 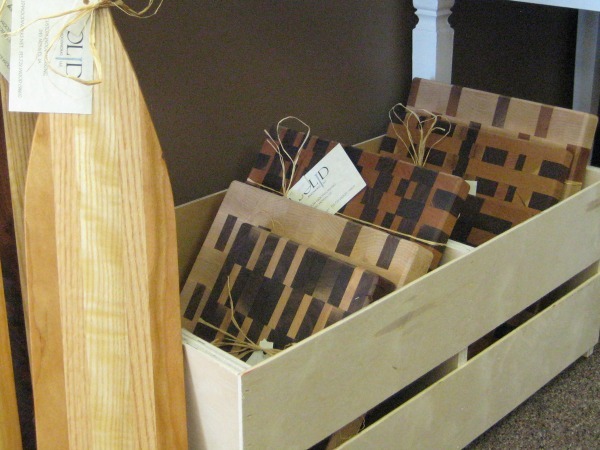 Here are (much fancier than mine) cutting boards. They are gorgeous in person. 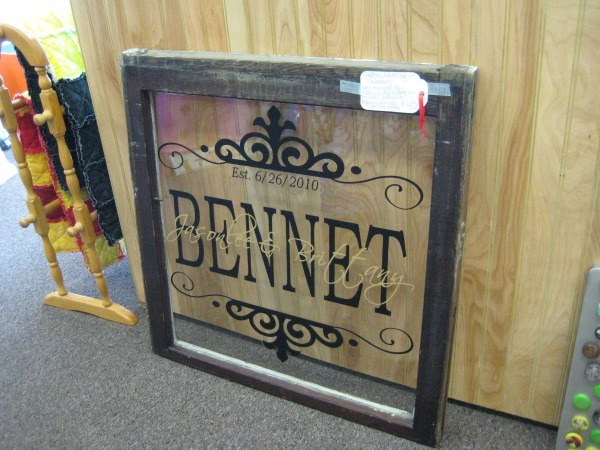 Custom work makes this piece special. I’m thinking anniversary gift for ourselves! 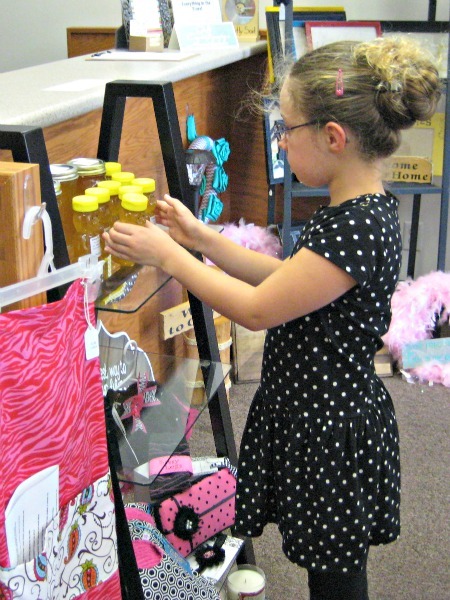 This entry was posted in bees and tagged honey, iowa gifts, sweetly said gifts. Bookmark the permalink.